On the 23rd of April, Gothenburg Roller Derby hosted Derby Dancing, a triple-header with two visiting leagues. Joined by Crime City Rollers from Malmö and London Roller Girls, both The A-Team and Badass Beavers played one game each. And keeping with the theme of the day, 1980s music blasted from the speakers in Lundbystrandshallen. First up were our two guest leagues. London Batter C Power took on Crime City B in an intense game where Crime City came out victorious. With great skills, Crime City took control of the game, but London put up a good fight and soon started gaining on Malmö. After the final whistle, the score read 151 to London and 216 to Crime City. For the second game of the day, Gothenburg’s Badass Beavers faced off against Malmö’s Crime City Cittens. Crime City took the lead pretty quickly, managing to score 22 points in the first five minutes, and by half time had secured 141 points over the Beavers’ 49 points. But as the game progressed, and as we entered the second half of the game, Badass Beavers held on, worked really well together and started scoring more and more points. In the end, Crime City Cittens won the game with 294 points against 122. Then it was time for The A-team to play against London Batter C Power - Little London vs. Big London. The A-Team quickly took control of the game, securing a lead of 27 points against five after the first five minutes. But as we entered the second period, it turned out to be a real nail biter, as London was just behind The A-team score wise, and kept closing in. But The A-team managed to stay ahead of London, and in the end won the game with 164 points to 110. We would like to send a huge thanks to the teams, NSOs, announcers, medical staff and every volunteer who made this fantastic day happen! And of course – thanks to everyone who came and watched the games and who attended the fabulous after party! We had a blast, and we hope you did too! After this weekend The A-Team have climbed to number 29 on the European Flat Track Stats and aims even higher. 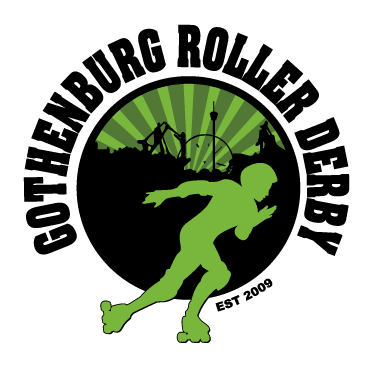 Next up for Gothenburg Roller Derby is the SKOD Tournament in Gent, 6 - 8 of May. Derby Dancing - Have the bout of your life! Nobody puts anyone in a corner, but the refs might put you in the penalty box if you don't behave. Gothenburg Roller Derby invites you to Derby Dancing and we are all about the eighties right now. Shine bright in neon and don't leave your legwarmers at home! You don't want to miss out on our visitors from Malmö, Crime City Rollers, and all the way from England, London Rollergirls! And folks it's a TRIPPLEHEADER!!! Mark down April 23 in your calendars and join us at Derby Dancing!